One of the most important things on your vehicle is your steering wheel. That is why it’s a mystery why for many decades now most cars have come with a very generic steering wheel. 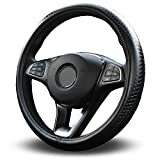 These steering wheels can be slippery, cold or hot to the touch and not so easy to grip in certain areas of the wheel. That is why many people put covers on the steering wheels of their car. How do you know what the best steering wheel cover is for you? Read on the steering wheel cover reviews and we will give you all the information you will need to make a good steering wheel cover buying decision. Here is a well-designed steering wheel cover from Vitodeco. It goes on easy and stays in place once it has been installed on your steering wheel. It fits better than many other steering wheel covers that we tested. It comes in a variety of different colors and sizes, so make sure you get the one that is the best fit for your particular size steering wheel. This steering wheel is so comfortable it will make your whole driving experience better. This steering wheel cover is exceptionally comfortable. You might even look for excuses to drive your car it’s so soft. The so-called ‘dragon scale grip design’ keeps your hands firmly in place when driving and makes it very easy to turn the steering wheel. If you want a fancy looking steering wheel cover this is not it. It’s more of a generic looking steering wheel cover. You can also feel the hot and cold temperatures of the steering wheel through this cover which was somewhat surprising. Wheelskins has designed here a good looking and classy steering wheel cover. It is universal in fit so it can be used on many different types of vehicles. It also comes in one of over 15 different color choices. It is a cover that will even enhance the looks of the interior of your car when it is on; unlike so many typical steering wheel covers that are an eyesore. It will make you drive and handle your car much more comfortable and easy too. There is a lot to like about this steering wheel cover. 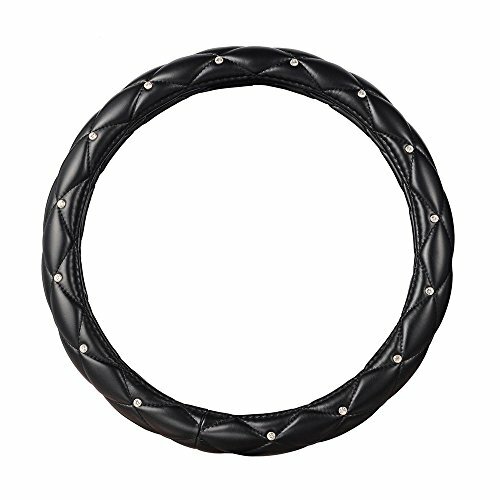 For one thing, it is one of the few steering wheel covers on our list that is made of genuine leather. It also comes in an amazing variety of color choices. For one thing, this cover will not fit in everyone’s budget. The fact that it’s made of genuine leather drives the price up a bit. It is also a universal steering wheel cover so that sometimes makes it difficult to install on some model vehicles. This is a steering wheel cover that is made out of a microfiber type cloth that is very soft. It is an excellent design as far as grip is concerned too. This steering wheel cover is of a universal design so it will fit a variety of different vehicle models. 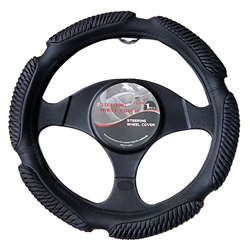 It is made with all ECO-friendly materials and will fit any standardized steering wheel that is from 14 ½ to 15 inches in diameter. It also comes in a wide variety of colors. It is hard not to like the price of this model steering wheel cover. It is one of the least expensive steering wheel covers on our review list. This cover is also made with really soft padding and provides you with an excellent grip while driving. We see the definite possibility of some wear issues with this product because it is not made of genuine leather like many steering wheel covers are. Another thing that bothered us was this cover was very hard to stretch over the wheel but looks great once you get it done. Here is a very budget friendly and really comfortable steering wheel cover. Aumo-mate has also dared to be very different with the design too. It is made out of very soft imitation leather and it’s easy to install too. This steering wheel cover comes in a wide variety of vibrant colors and even has rhinestones embedded in it. It will fit steering wheels that are 37 – 38 centimeters in diameter. For one thing, this steering wheel cover is offered at an excellent price point. It is a very comfortable steering wheel cover too because it features a lot of thick padding and texture that gives you some excellent grip. This cover is also very well stitched together so it should last a long time too. This was an interesting design here but we have, to be honest, and admit that many of us did not like it. It definitely would only appeal to a select few. Even the colors it comes in are very different than what would be considered normal. This is another very budget friendly and nicely designed steering wheel cover. It does a nice job of providing a safe grip so you have better control over your vehicle as you drive. It has a very soft feel to it and also looks to be well put together. This steering wheel cover will easily fit steering wheels that are up to 15 inches in diameter and comes in several different colors. This steering wheel cover is very comfortable and fits really well. It is a big step up over the feeling you get when driving with an uncovered steering wheel. Your grip will also be exceptional with it and there is not a lot of uncomfortable stitching all over the place. 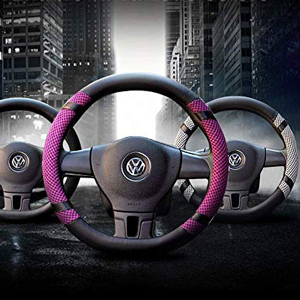 This is an extremely generic looking and basic design steering wheel cover. It won’t distract from the looks of your car’s interior but it won’t enhance them either. When the air conditioning was on in the vehicle this steering wheel cover became a little slippery too. You have to be patient when stretching it over your steering wheel also. BOKIN has a great product to offer with its really comfortable steering wheel cover. The product can fit any steering wheel from 14 ½ to 15 inches in diameter. Also, the unit comes in many colors, so you will be able to not only feel the nice grip of the wheel, but also give your car a new fashionable interior look. The materials used for this product is what we considered a benefit. This steering wheel cover is made of microfiber leather and viscose which makes it quite durable and less prone to extreme temperatures. In other words, if your car happens to be parked in direct sunlight, that microfiber leather will not get hot. In addition, it is very easy to clean and is antibacterial. Another plus that we saw in this unit is the 18-month warranty. There are some things that worried the members of our team. It seems that the steering wheel cover is hard to put on and you might need to use all the strength you have to adjust it on your steering wheel. Then, you should think about the fabric part of the product because it may start unstitching after a few months of use. SIZE : 13.5" - 14.5"
MATERIAL : High end rubber material. Motor Trend has a lot of good auto products and this steering wheel cover is one of them. It is made of a comfortable and soft synthetic material so it will stay cool and last a long time. This is a cover that will fit smaller size steering wheels well. It is odorless and provides a good grip without the stickiness that some steering wheel covers have. 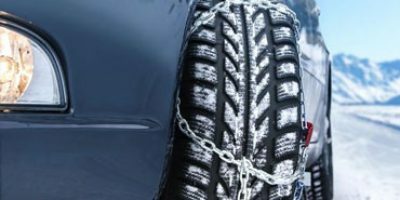 If you look at the sizing charts for the products on our review list you will notice a pattern; there are not many covers that will fit vehicles with smaller size steering wheels. That is not a problem here because this nicely made steering wheel cover is designed to fit vehicles that have smaller 13 ½ – 14 ½ inch steering wheels. This steering wheel cover is very basic and does not have many styles to it and that is a little bit disappointing. This is yet another steering wheel cover that you really have to strain to put on but once it’s on it fits really well. Mayco has done a good job designing this particular steering wheel cover. It is made of very soft and pliable imitation leather. It is a great looking cover that also offers superior grip when your hands are placed on it. It goes on a little tight but bears with it because it is made to fit that way. 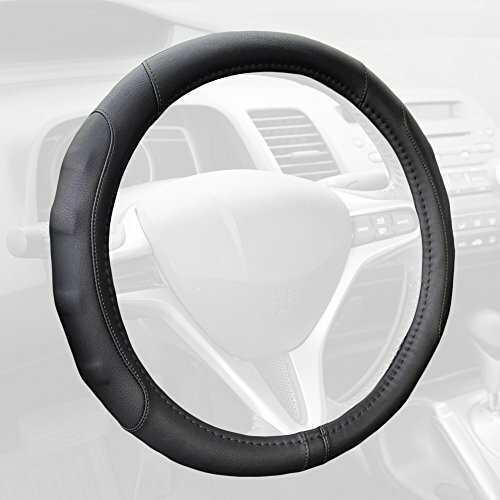 This cover is sized to fit any car that has a steering wheel that is 14 ½ to 15 inches in diameter. This is definitely one of the nicer looking steering wheel covers on our review list. We all thought it adds a little bit of style to the interior of the car when on. It also is a steering wheel cover that is very soft and gives you a good tight grip on the steering wheel when driving. 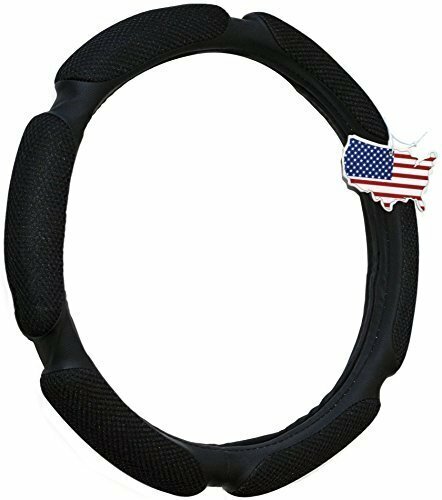 Something that those with small hands might want to think about before purchasing this steering wheel cover, it is extremely thick once installed. After taking a close look at the stitching in this product we feel there could be some durability concerns too. Here we have another great product at a reasonable price, but this time comes from Valleycomfy. 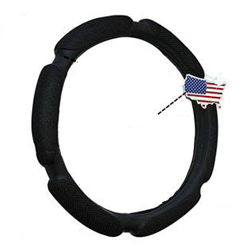 As the manufacturer’s name suggests it, this steering wheel cover is designed to give your hands the best comfort while steering the wheel, especially in long distance rides. Also, this wheel wrap is designed to fit all 14.5 to 15.5 inches steering wheels and comes in many color options to match your preferences. We really liked the durable materials used for this steering wheel cover. And we can assure you that the genuine leather this product is made of will withstand the stresses of everyday use. 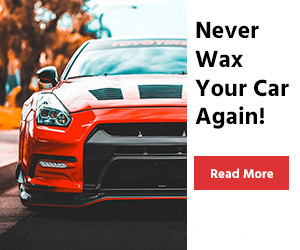 Moreover, due to the perfect sewing and chosen materials, you will avoid the wear and tear of the cover and at the same time forget about sweaty hands losing the tight grip of the steering wheel. In addition, the unit’s appearance on the wheel will add class and style to your car’s interior. We kind of fear that no matter how stretchable and foldable this wheel cover is, the fact that it comes folded may result in creases which cannot be removed even when you install the unit. For those Star Wars fans that need a steering wheel cover, we hope you have read this far because we have a nice little item for you here. It is a cover that is priced right and will also help provide some grip on the steering wheel as you drive. It is a steering cover that will fit on most any type of steering wheel that is 14 ½ to 15 ½ inches in diameter. This cover only comes in one color and you probably could have guessed that color is black. 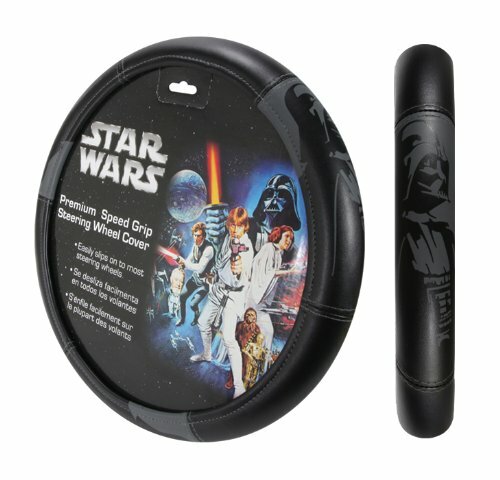 This steering wheel cover is not for everyone but if you are a Star Wars fan then it might really appeal to you. There is a Darth Vader figurine etched right into the simulated leather. If you have a blue or black interior this steering wheel cover looks great. Unfortunately, this steering wheel cover probably is better off as a novelty item than it is a steering wheel cover. It fits well but it has a tendency to move around a little even when fastened securely. 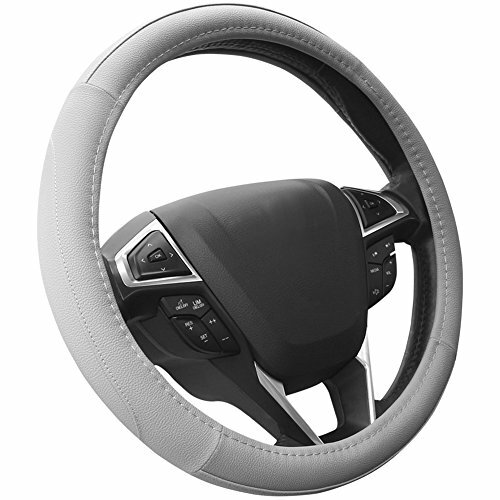 It also is not as thick and comfortable as many of the other steering wheel covers on our review list. This is a very good microfiber and simulated leather steering wheel cover. It has the best of both worlds; the soft feel of leather and the light, airy grip of microfiber cloth. It is a steering wheel cover that comes in a variety of colors and will fit on vehicles that have slightly larger steering wheels. 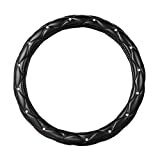 This product will go on steering wheels that are 14 ½ to 15 ¼ inches in diameter (38 cm). We liked the design of this steering will cover very much. Even though it is soft and supple on the outside, the inside is lined with a rubbery type compound that makes the cover stay in plays very good. It is stitched together very well too and we can see this steering wheel cover lasting a long time. This cover is a little bit of a struggle to put on but be patient and you will get it on. A few of us thought it was a little too thick also; something to definitely consider if you have small size hands. This is a sporty and nice all weather steering wheel cover from Everything Automobiles. It goes on very easily yet still fits on tightly once you have it in place. It comes in a variety of colors that will actually accent the interior of your vehicle. It is a universal type steering wheel cover that will fit a large variety of different sized steering wheels. This cover can go on any size steering wheel that is between 14 ½ to 15 ½ inches in diameter. This steering wheel cover has some very good insulating properties. Even with the heat and air conditioning on it still maintained an even temperature. It is made out of a material that is soft but still allows air to flow through it. This may seem nitpicky but we did not like the way the air freshener hooks on the steering wheel cover but fortunately, you can remove it and get it out of the way. There is also a little bit of loose material on the very outer edges of this steering wheel cover. This is a very good and affordable steering wheel cover from APZONA. It has a cool look to it as it features one of a unique design of all the covers we tested. Do not mistake that for meaning this is not an excellent steering wheel cover because it works very well for enhancing your grip when you are driving. It is also a steering wheel cover that is soft and supple to the touch. This cover will fit steering wheels up to 15 inches in diameter. This steering wheel cover has a very interesting design to it. It has a distinct and sporty look to it. It gives the best grip of any steering wheel cover that we tested. 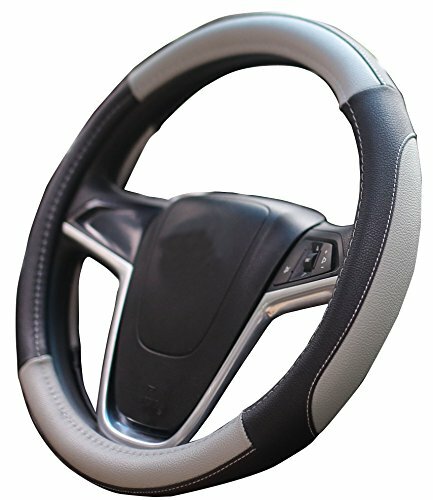 Its unique design does not allow you to slide your hand very far when using this steering wheel. Most of us here liked it but a select few said the wave pattern it has on the outside was a little bit annoying to them. One word of caution is that if you are sensitive to some industrial type smells that don’t fade for a long time, then this is not the steering wheel cover for you. If you want a steering wheel cover that is as close to real leather as you can get without the price tag, then this cover may be the right one for you. It is stylish and comfortable and goes great with the interior of your car if you choose the color match right. This is one of the better-looking steering wheel covers on our review list. It has a sporty type look to that is not overpowering. It is also stitched together very well and appears to be a cover that will last you a long time too. It is a little on the pricey side considering that it is cowhide instead of real leather. This steering wheel cover is very hard to put on and you need to follow the directions closely or you just may rip it like we did. If you read the reviews you probably have been noticing that there is a lot more than meets the eye when it comes to steering wheel covers. There are definitely many things you should consider in order to make a sound buying decision. 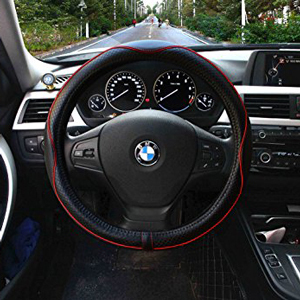 Here are some of the main points about steering wheel covers that need to be highly considered before you decide which one to buy. Most everyone has a set price in mind of what they are willing to spend to spend on a steering wheel cover. When deciding this you must be realistic about your expectations. You are not going to be able to do such things as finding a genuine leather steering wheel cover for under $20. 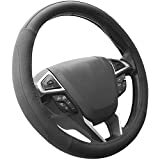 When you start your search for a steering wheel cover you will find that you will see similar quality steering wheel covers at prices that are close to each other. That is because in the steering wheel cover marketplace price is often a good indicator of the quality of the cover. Like any item, there are also no exceptions to this rule and you can find some quality covers that are a little less money than some that are very similar. These are the most common and least expensive type of steering wheel cover. They can use anything from polyester to microfiber fabrics in their construction. 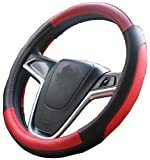 They can also be the most decorative and color versatile steering wheel covers. The drawback to them is that they are usually not as comfortable as other cover materials and they often do not last as long either. Cowhide is a less expensive alternative to leather that will give you many of the same qualities it has. It is not quite as soft and supple as leather. It is a steering wheel cover that is hard to accent with such things as colors and decorative textures. These are by far the nicest and most expensive type of steering wheel cover. This material tends to be very soft and supple. 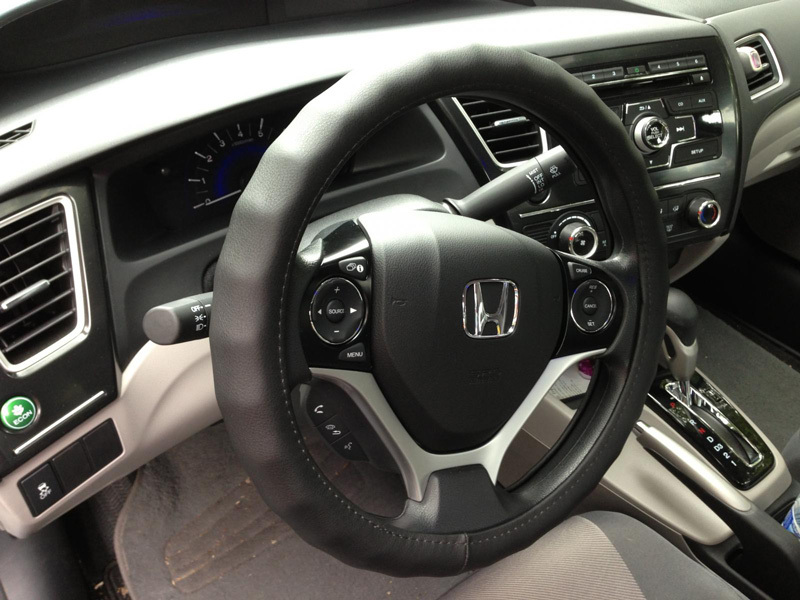 That makes leather steering wheel covers install nicely and feel good as you drive. The drawbacks to leather other than the cost are they have a limited color selection and it’s tough to add extra padding to the back of it. Most covers will specifically say on the package what size steering wheel they will fit. You would be wise to follow the size they fit very closely. It is hard enough to stretch on most steering wheel covers as it is, let alone try to put one on a steering wheel that it was not made to go on. You also don’t want a steering wheel cover that is too big because it will bunch up and be too bulky; this can make the steering uncomfortable and even dangerous when you drive. You want to buy a steering wheel cover that has a warranty that comes with it if at all possible. Look for one that will give you at least 90 days to make sure there are no material or workmanship problems with the new cover. This will give you the little extra confidence that you need to know that you have made a wise steering wheel cover purchase. It will also alert you as to how much confidence a manufacturer has that they have made a quality product that will hold up well for a long time to come. One of the biggest complaints people have about steering wheel covers is how hard they are to put on. That is because you want them to fit good once they are on so the manufacturers leave barely enough room to stretch them on. It can be very frustrating, to say the least when it takes a while to do this. Read the instructions that come with your steering wheel cover thoroughly. No one knows how to put on your steering wheel cover better than the company that makes it. Trust us they will make the job as easy as possible if you follow their instructions. Do this by laying it out in the sun for a little while or by heating it up with a hairdryer. Don’t do anything drastic like putting it in the microwave or heating it over an open flame because it will probably ruin your new cover. If your cover is a wrap style you will have to thread the securing laces through the pre-punctured eyelets in the steering wheel cover. This much easier to do if you use a leather needle to guide the laces through the eyelets and if you add a little wax to the lacing to make it slide through easier as you thread it. Putting on a steering wheel cover takes some time so don’t be in a hurry when you are doing it. Taking your time and having patience is a very big part of installing any steering wheel cover that you purchase. You may also like Everything about vehicle window tinting and car power inverters! By now you probably realize that there is a lot more involved in buying a steering wheel cover than just getting the size right. There are simply many things that factor into your steering wheel cover buying decision if you want to truly get the best steering wheel cover for your needs. We hope the tips and information we gave you here helps you with your buying decision. 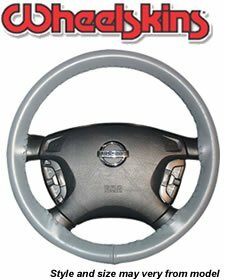 Remember also, you can never go wrong by buying one of the excellent covers we have given in this steering wheel cover reviews too. Having the proper steering wheel cover is far too important when it comes to safe and comfortable driving to take a chance and get this purchase wrong. Just ordered this leather cover https://www.amazon.com/gp/product/B074DJYR8K/, seems like genuene leather and feels pretty good. You should add to your list of recomindations.